Who here is on the hunt for quick vacation or week-night meals? *raises own hand* With our little girl starting daycare next week and me going back to work the week after, we are on the lookout for delicious meals that can be prepared and cooked in advance or while we’re at work. 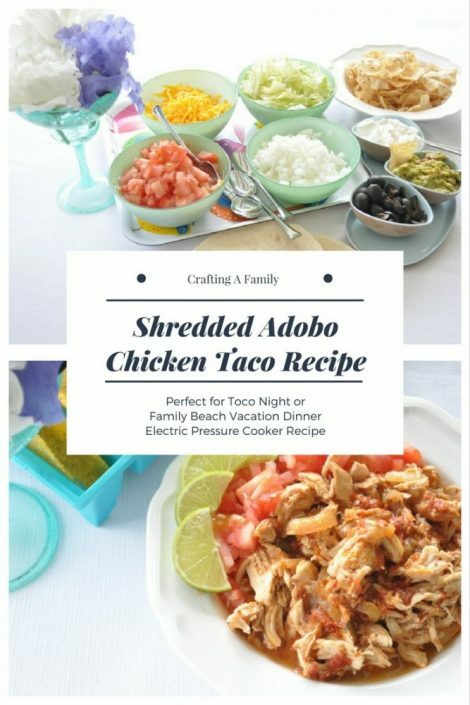 My husband’s Mexican, so of course adobo sauce is something we know well and love to use when cooking! This recipe for pressure-cooker shredded chicken in adobo from Crafting a Family sounds like the perfect addition to our quick-meal roster. It makes a great addition to our Spectacular Summer Blog Hop, because so many of us are back to school shortly and are in need of tasty, simple meal ideas. Part of the fun of this summer-long blog hop is getting to know each blogger through some trivia. Here’s a bit more about Susan from Crafting a Family. The best place I ever visited was Germany when I was 16 years old. the gates of hell on time”. Meaning to slow down and take your time to do things right.